Guided meditations into the archetypal energy of Tarot cards can be a profound experience. You gain more than just a greater understanding of the card’s meaning. By immersing yourself in its energy you open yourself to new insights into personal situations and issues. Click this ‘Play’ arrow to start your journey with the High Priestess. The haunting and evocative music accompanying the meditations is composed and performed by Piotr (Peter) Nowotnik, a versatile composer and performer of music in a variety of genres including pop, folk, world music, electronic, period and music for meditation. CD cover design is by Rachael Hammond. Jeni Bethell (BA, Dip Ed, MA) has been a professional reader of Tarot Cards for the past 20 years in Melbourne, Australia. She is a founding member of the Tarot Guild of Australia and a regular speaker, presenter and writer on Tarot matters. Her articles have appeared in Living Now, Taros: Journal for Tarot Studies, Spheres: The Spirit Guide, and The Magician, journal of the Tarot Guild of Australia. Her Facebook and Twitter daily card quotations enjoy a popular following. 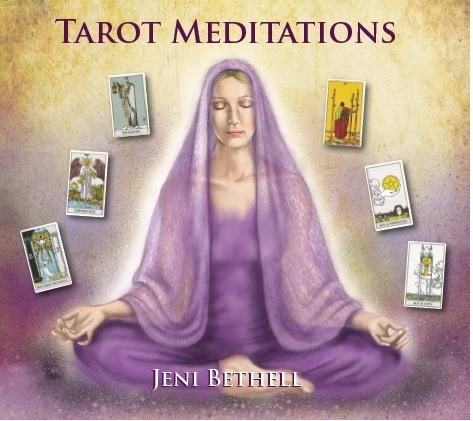 During her professional life, Jeni has conducted many courses and workshops on various aspects of the Tarot, Meditation and Women’s Spirituality. For more information visit Jeni’s website and her Facebook page. $17 for double CD package (plus postage – $2 in Australia, $4 elsewhere). The CDs are usually posted within 48 hours of us receiving your order.